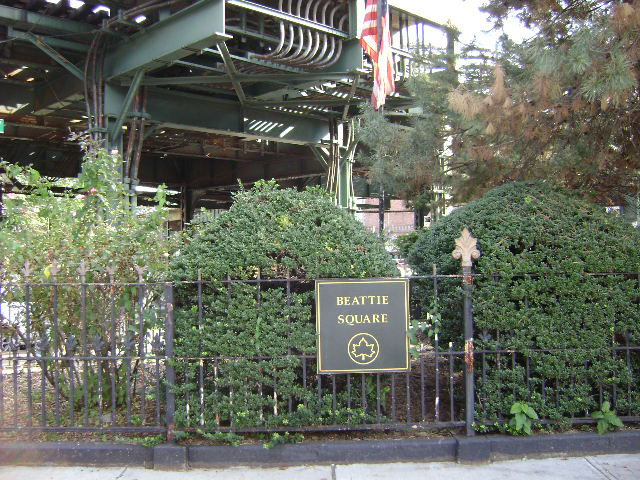 Beattie Triangle, bounded by Broadway to the northeast, Vernon Avenue to the south, and Stuyvesant Avenue to the west, is named in memory of Joseph S. Beattie, who lived at 247 Schenectady Avenue in Brooklyn. Beattie served as a Private in Company G of the 305th Infantry in the United States Army in World War I and died on a battlefield in France on October 5, 1918. 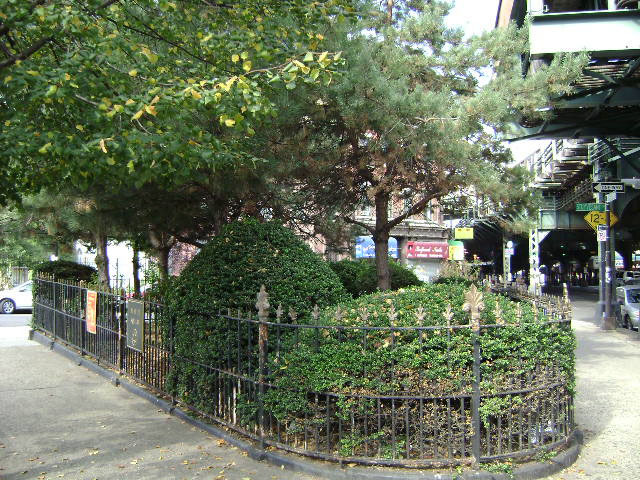 Beattie Triangle is one of the oldest public parks in Brooklyn. Anton and Mary Vigelius deeded it to the City of Brooklyn in 1884 for one dollar on the condition that “the same shall be enclosed with an iron fence and forever kept as a public park or place.” In 1898, when Brooklyn was incorporated into the City of New York, the deed was transferred and came under the jurisdiction of Parks. At the insistence of the Beattie VFW Post, Beattie Square was named by local law in February 1921. This woodchip-lined park, which faces the neo-classical Urban Sports and Cultural Center, lies just inside the boundary of Bushwick on the Bedford-Stuyvesant side. Bushwick, one of the original six towns of Brooklyn, comes from the Dutch word “boswijck,” meaning “town in the woods.” Chartered by Director General of New Netherland Peter Stuyvesant in 1661, Bushwick was settled in the nineteenth century by tobacco and grain farmers from France, Scandinavia, England, and Holland. By the mid-1800s, Bushwick boasted eleven breweries on a fourteen-block stretch known as “Brewer’s Row.” Manufacturer and onetime presidential candidate Peter Cooper built his first glue manufacturing factory here in the 1840s, joining the sugar, chemical, and oil industries. The subdivision of farms begun by Adrian Martenses Suydam in 1869 led to a population growth that gained even more momentum after 1888 when railway access made commuting to Manhattan easy and living in Bushwick increasingly attractive to professionals. On May 31, 1924, a 12,000 pound German Krupp gun captured by the British in World War I was mounted on the concrete base in the center of this triangle. At one point, many parks featured similar weaponry in their war memorials, but today, only eight similar guns remain. The rest, like this one, were melted for scrap metal in World War II to make new arms. Coniferous evergreens, pink and white primroses, hedges and thorny bushes make this site a woodsy escape from the surrounding streets. An elegant black and gold four-foot-high fence encloses Beattie Square. The sole gate on the Broadway side opens to a path which leads to the center of the triangle. An American flag flies in the middle of this triangle as a patriotic tribute to a brave young man who made the ultimate sacrifice for his country.